The required park sign photo! For spring break, we usually escape rainy Portland to seek the sun in places like Arizona, Palm Springs, or the US Virgin Islands. But this year, we decided to chase some winter weather in Montana’s Glacier National Park. We found snow, sun, and lots of solitude in what we think is one of America’s most beautiful national parks. When we’ve been to Glacier before, in summertime, there’s been all kinds of people and activity and plenty of huckleberry ice cream. In winter, not so much. Although we knew the Going-to-the-Sun Road and some other roads in the park were closed for winter, we didn’t realize much of the surrounding area was also closed for winter. If you’re making a winter trip to Glacier, you’ll definitely need to plan ahead! 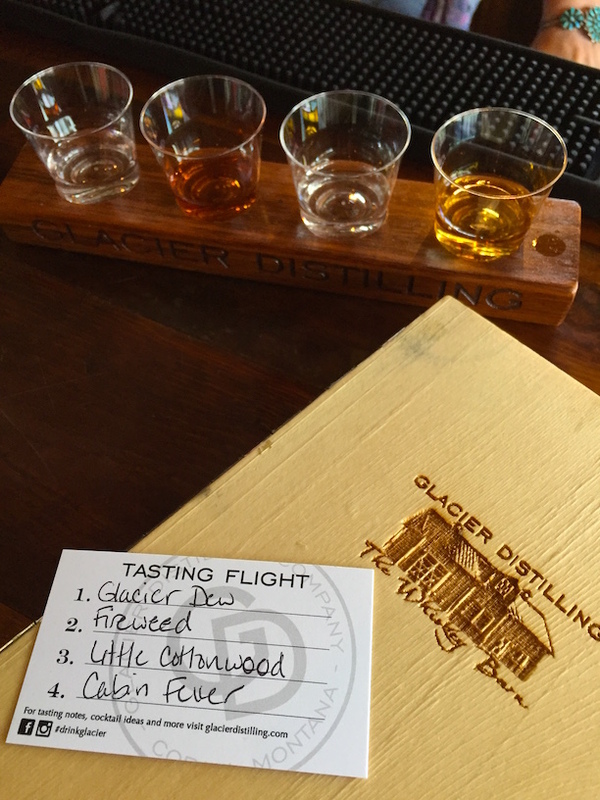 The Glacier Distillery is a great place to warm up from the inside! In winter in Glacier, there is no huckleberry ice cream (the one true tragedy of our trip). The West Glacier post office and one gift shop are open during the week, and the Apgar visitor center and the Belton Chalet restaurant are open, but only on weekends. There are some nearby bars, a great distillery near West Glacier (drinks only), and a couple small restaurants on the highway between West Glacier and East Glacier, but there really aren’t many options for eating out without driving back to Columbia Falls or Whitefish. Nor are there many choices for winter lodging right around the Glacier entrances. The Belton Chalet, located just across the highway from the west entrance has just two cabins they rent out. All the park lodges are closed in winter. Very few of the local hotels seemed to be open. There are two park campgrounds open in winter — at Apgar Village and St. Mary. Believe it or not, we saw tent campers at Apgar our first weekend here! Brrr! 20 miles west of West Glacier, Columbia Falls offers some lodging and restaurant options, and 30 miles west of West Glacier, the town of Whitefish has several lodging and restaurant options. About 30 miles east of West Glacier, in Essex, the delightful Izaak Walton Inn is open in winter. They have their own restaurant and lots of cross country skiing and snowshoe trails. Browning, near the East Glacier entrance, has a casino and adjacent Holiday Inn Express as well as some other services like restaurants, gas and groceries. The great news in all this? With a little planning you can have an extraordinary experience in Glacier National Park because in winter, the crowds are gone! There are still people in the park (we spotted license plates from 25 states! ), but they’re spread out to enjoy the park. We hiked trails where we saw only a few other hikers. We watched the sunset at Lake McDonald on four different nights and had the place to ourselves two of the nights. We snowshoed for two hours without seeing anyone else. To find that kind of solitude in such a glorious place is really something special and worth planning for! And that solitude paid off in wildlife sightings, too: we saw a moose in the St. Mary River, nearly 30 white-tailed deer scattered throughout the park, two skunks, Common Mergansers, and even a snowshoe hare! Of course, visiting in winter means wintry weather! We visited in late winter, right around the spring equinox. Daytime temperatures were in the 40s (5-10° C) and nighttime temperatures dipped below freezing. We had lots of snow falling outside our home exchange house near Martin City, but little to no accumulation. (We also had some rain and several hailstorms!) Luckily, we had some gorgeous, sunny days too (despite cooler temperatures), and were able to spend six or seven of the eight days of our trip outdoors without getting wet! 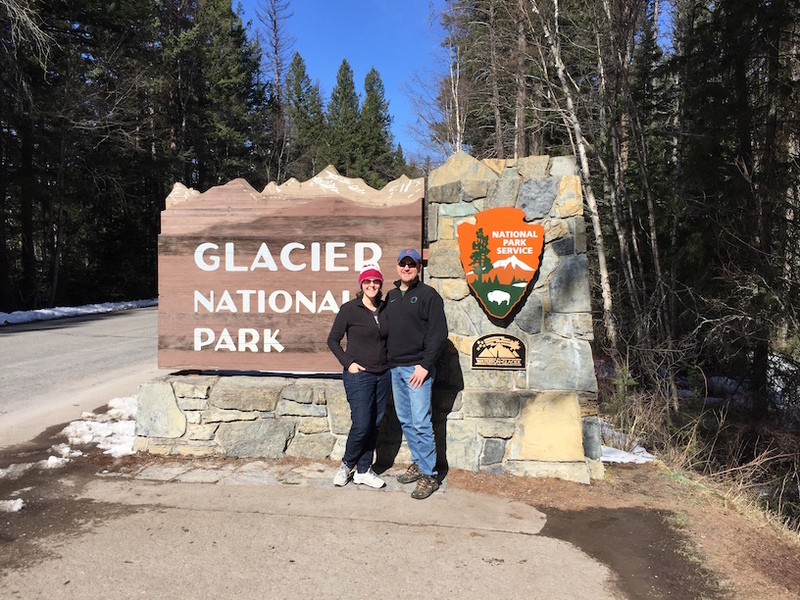 While there was a bit of snow still on the ground in the lower elevations of the park, driving along the park’s southern border on US 2 took us up into the Rockies where we found lots of snow! To keep warm, we dressed in layers (and packed rainproof gear, too) and wore snow pants during our snowshoe adventures (primarily to keep our legs dry but also to keep warm!). Erin wore her flannel-lined jeans and Jeff wished that he had worn his, and we both wore our Heat Holders socks, which were awesome for keeping our feet warm while watching sunsets at the lake and cozy for wearing around the house! We definitely recommend them! Have you visited Glacier in winter? Leave us a note in the comments about your favorite experience there, and enjoy your next national park adventure, whether it’s for a week or a weekend! McDonald Falls, 2 miles from the Lake McDonald Lodge up the Going to the Sun Road. 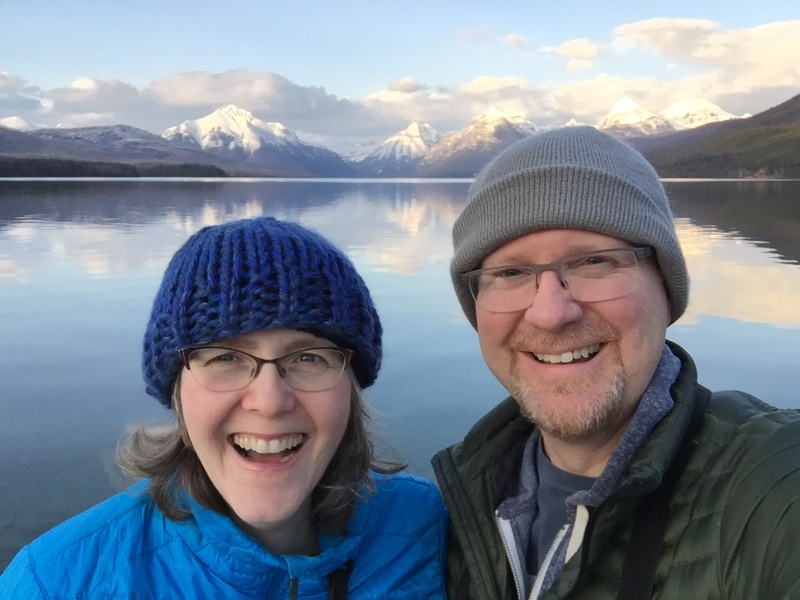 We watched the sunset at the Lake McDonald Lodge with only four other people. The only other person we saw snowshoeing! A lovely, lonely path for snowshoeing in the Lewis & Clark National Forest. Lots of rabbit tracks, but no people tracks. Snowshoeing in the Bob Marshall Wilderness, just outside Glacier. No one else was around. Hiking up the Going to the Sun Road. We saw about 20 people on this hike – the most we saw anywhere in the park. Many Glacier was jaw droppingly gorgeous the day we arrived. It was freeezing down at Many Glacier, but the only people we saw were two people riding BIKES! Disclaimer: Heat Holders provided us each with a pair of socks to test out on our Glacier National Park adventure. However, all opinions are our own. Great update on your adventure! Makes me want to go in winter for sure! Sorry about the sad ice cream experience. :(! But I hope you got some yummy hot drink instead, something decadent with salted caramel perhaps.